Tricky Tweeple Social Spammers Seo Sinners Linkbait Liars and Asinine Advertising a Web War of the Wordsmith’s: Reaction Marketing meets Linkbait Marketing, Association Advertising Evolved? First in a New Media Concept Series: Making Twittered New Media Make Sense by Tweet-Re-Construction. 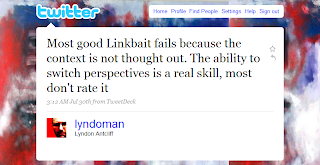 "Most good Linkbait fails because the context is not thought out. The ability to switch perspectives is a real skill, most don't rate it"
Many times we tweet a brilliant idea yet lose it. Why I am not sure, new media is young in its applications uses and workings. To recall, why not re-organize and re-list? 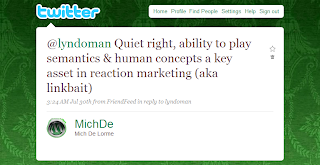 To often do we scatter our skills in random quotations, why not re-collect tweets re-compile postings and reclaim them? "Yet another new media concept?"